Now what kind of party do you think that is? 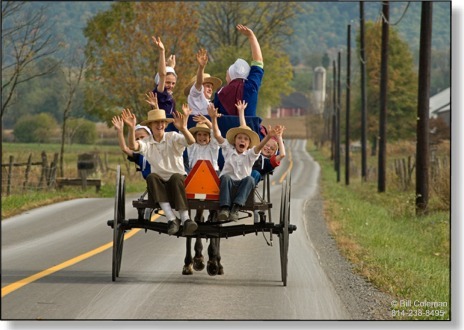 Every couple of months we get together for a big family dinner with our Amish family friends. Saturday was the big fall dinner at my house. I spent all day, cleaning the Faux Farm and going to Wegmans market for my home cooked meal. Ok, I made brownies and a chocolate pudding pie and Wegmans made the fried chicken, scalloped potatoes and a ton of desserts. Hey wait, I made the salad too. We also invited my Amish neighbors and their four little kids to come over for a dessert party after dinner. Well, everyone showed up at the same time, the Aaron’s were late and the Jacob’s were early. So the Jaacobs’ ate a second dinner with us and then we all had dessert. In case you are wondering, families are often referred to by the father’s first name in the plural form. I guess there are more original first names than last names so it is easier to get the families straight this way. The teenagers watched the Penn State game and the little kids watched Sponge Bob as a special treat. Nothing like going to the English house and watching TV. The rest of us had a wonderful time chatting about the upcoming wedding. 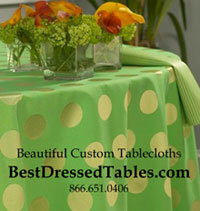 Yes, I will be doing the tablecloths. And yes the parents have the same reactions as English parents when a daughter gets married. The Dad is worried he is losing his little girl and how could everything cost so much. Mom is worried about getting everything fixed up around the house and getting the dresses ready and making sure everything is taken care of and wishes her husband would stop worrying about all the money. I will chat more about the wedding as we get closer and I get more information. Bob and I are going to the wedding and are thrilled to be invited. It was nice to just sit and chat inthe cool of the evening on our screened in porch and talk about our different ways of like which are surprisingly similar when you dust off the fine veneer that seems to separate us. My neighbors up the street had invited us to an wine tasting party which we had to decline, though I am not a wine drinker I would have liked to get to know the neighbors a bit better. We have owned the Faux Farm for 5 years and only know the neighbor to the right and to the left as we aren’t there all the time. So in this tiny group of 8 homes there were two parties Saturday night, one with a lot alcohol and one without any at all. But I am sure we had better desserts! The van driver came to pick up the Aaron’s about 10:30 and they loaded up and off they went, dropping one of the teenage boys at a friends house on the way home. No different than we have done after we made our children to go a family function. I waved goodbye and promtly went into and watched TV. How English of me!